You may never have thought of tattoos as non-vegan, after all, it’s just ink right? Unfortunately, this ink has traditionally been made from animal products. While there are more and more vegan inks on the market, anyone who wants a 100% cruelty-free tattoo needs to make sure that they visit a vegan tattoo studio. Tattoo ink can contain gelatin, glycerine and even shellac, which is made from beetles. One of the main inks that uses animal products is black ink, which is of course the most popular colour for tattoos. Non-vegan black ink is made from bone char, which is said to give it the deepest, blackest colour possible. Lovely. Even brands that advertise as being vegan for other colours sometimes put this by the wayside when it comes to black, so always double check! What is vegan tattoo ink made from? In a 2005 study by the University of Arizona nearly every brand of tattoo ink was found to have different ingredients. So even with vegan tattoo ink, it’s difficult to tell everything that’s in it. They do tend to be more carbon-based however and replace animal fat with vegetable glycerine. So a vegan tattoo is better right? Surely having no animal parts in it means it is safer for our skin too? Well, yes and no. Vegan is obviously better because it doesn’t cause cruelty to animals, but this doesn’t necessarily mean that it’s safer. Shellac is an ingredient in non-vegan ink that can cause people to have allergic reactions, but there are also a lot of other components to vegan tattoo ink. Inks aren’t that well-regulated, and some of the pigments in them can be potentially dangerous, when exposed to sunlight. Formaldehyde is also quite common, even in vegan tattoo inks, as a preservative. Apart from the animal products, vegan inks are made of the same stuff, and this can include metals such as nickel, so if you have a nickel allergy, be extra wary! Luckily, more and more inks are now vegan, but it can be difficult to know which ones aren’t, as they don’t exactly advertise the fact. Eternal Ink is a vegan tattoo ink that is made in the UK. They are proud to say that they have some of the lowest allergy reactions of inks on the market and ensure that no chemical or product that is banned in the UK makes it into their ink. Skin Candy is one of the most trusted brands on the market today. Buyers like it not only because it is vegan, but because it produces great results. The ingredients are all plant based, meaning a reduction in some of the potentially harmful chemicals found in other inks. This is a 100% vegan tattoo ink. It’s special not just because of their bright colours, but because they are leading the way against fake tattoo ink through their anti-counterfeit packaging. This brand has a really deep black shade as well, proof that you don’t need bone char to accomplish it! For a full list of vegan tattoo inks, take a look at this article by VeganTattooStudios.com. There are many other things in a tattoo parlour that may not be vegan friendly. 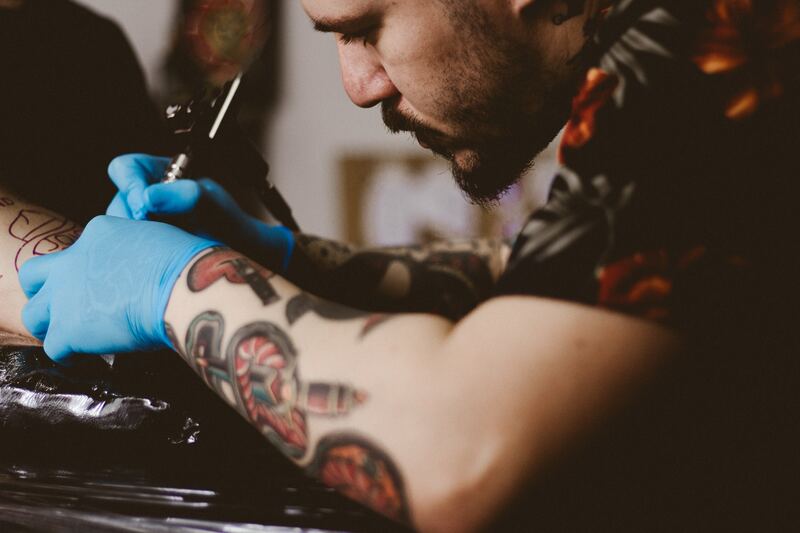 From the strips on disposable razors which can contain glycerine to the stencil paper, which can contain lanolin, the tattooing process can create a lot of hurdles for a vegan who wants some animal-friendly ink. Vegan tattoo care is also important. Many of the tattoo aftercare products on the market contain animal fats, so double check anything that’s going onto your skin. Vegan tattoo aftercare products do exist and are readily available – such as Hustle Butter Deluxe. This directory of vegan tattoo studios, which lists the studios in your area that are vegan, is a great resource. It’s not comprehensive however, so don’t be afraid of ringing up your local studio and asking if their products are vegan. By no means a comprehensive list, here are three fully-vegan tattoo shops based in England that we’ve picked out to showcase. As the name suggests, Darkside is a rock ‘n’ roll type of place. A vegan tattoo studio based in Suffolk, they do custom tattoos both big and small. Based in Hackney, Santo Cuervo specialise in vegan custom tattoos with an oriental feel. Particularly awesome at black and white or watercolour designs. A new studio based in Newbury which opened in September 2018, VARA Tattoo Studio is run by ethical vegan Steph who has previously won awards including Best Small Black and Grey – Female at the 12th annual Portsmouth Tattoo Convention and Best Large Colour at Reading Tattoo Show 2012. Experts will produce better results. A tattoo from a top vegan tattoo artist is going to last a long time because they know exactly what they’re doing. Do your research. Make sure you know what ink the vegan tattoo studio is using, what the ingredients are, and if you have any skin allergies that may cause reactions. Even with a vegan tattoo, aftercare is still important. We recommend Hustle Butter Deluxe as a vegan tattoo aftercare product. It soothes the pain and itchiness while encouraging healing, and still being cruelty free. Do you have a vegan tattoo and can you recommend any great vegan tattoo artists or studios? Let us know in the comments!